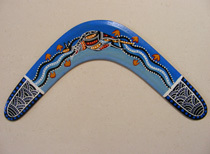 The above photograph shows 20" boomerangs displaying colourful Modern Aboriginal art designs. 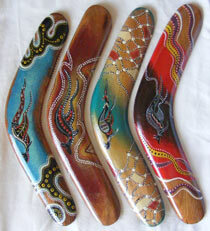 All Indigenous artifacts and Aboriginal art products at Australia Gift Shop are made in Australia. 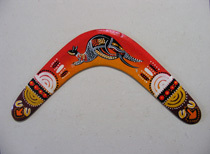 At Australia Gift Shop, every boomerang features Aboriginal art painted by Australian Aboriginal artists. 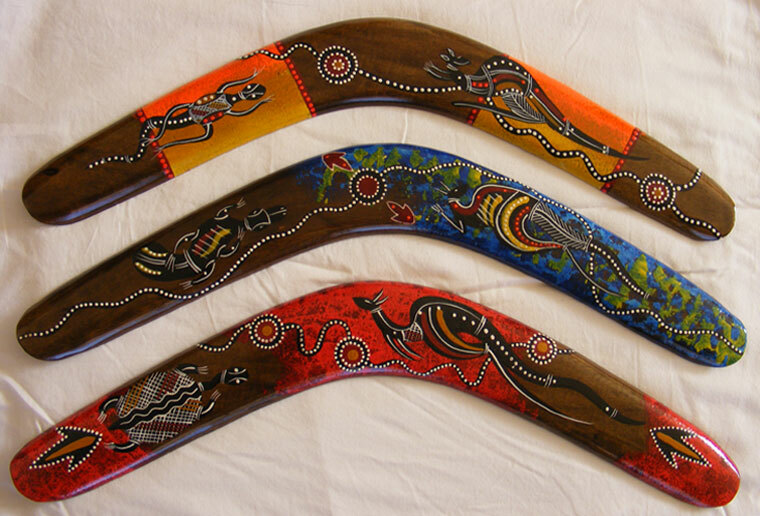 These artefacts are extremely popular as souvenirs of a visit to Australia, while the returning boomerangs are excellent gifts for all occasions for children (as a toy) and for active millennials (Gen Y), as a fun plaything, much like a hacky sack or a frisbee. Aside from purchasing here online, you are also welcome to place orders and make purchases by email and over the phone. See our contact page for details (opens in new window). Please visit boxed boomerangs if you are looking for Australian corporate gifts that are gift-boxed on timber display stands with brass plaques for engraving a company name or the title of a business event. 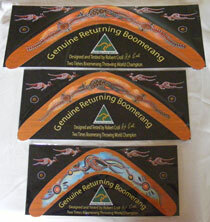 A Returning Boomerang : with Blue Kangaroo design 14"
A Returning Boomerang : with Red/Orange Kangaroo design 14"